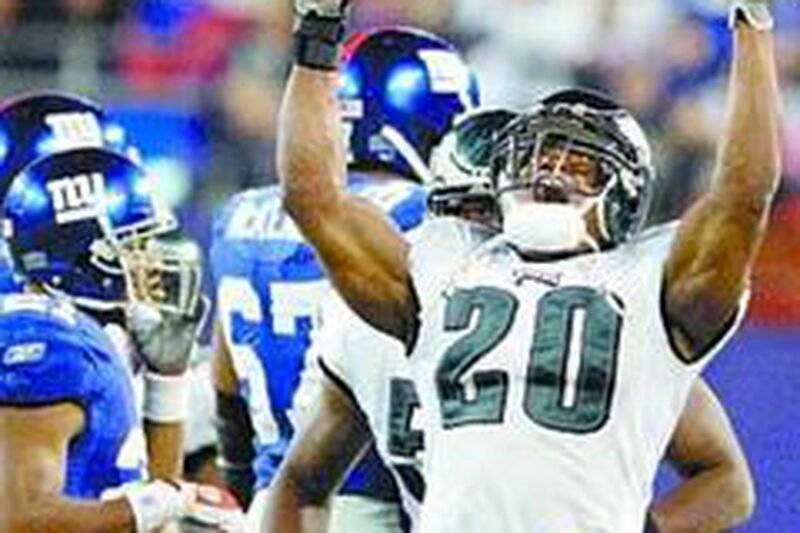 Brian Dawkins will begin his 12th season with the Eagles. TO TELL THE complete truth, that day in St. Louis was not yesterday and does not seem like yesterday; too many sports hernias (and other pains) under the bridge since then. This really did begin a long time ago. The reference is to the first NFC Championship Game under coach Andy Reid, following the 2001 season. It was the one where the Eagles fell 52 yards short of winning and quarterback Donovan McNabb famously sneaked out to the edge of the field to watch the shiny confetti fall and to see the Rams celebrate. There was not a single skeptic in the Eagles' dressing room after that game ended. There was disappointment, yes, but there also was a future that stretched ahead forever. Everyone could see it. No one doubted it. A few caveats were thrown in, for sure - you never know, the league is unpredictable, nothing is guaranteed, injuries, whatever - but that was NFL/CYA boilerplate and nothing more. No one really believed it. Caveats were for chumps that day. Why? Because the Eagles' 22 regular starters that season combined for only 104 years of NFL experience. They were so young. The Eagles are about to embark upon their sixth season since then, beginning with tomorrow's annual draft. There will be no predictions here about whom the Eagles are going to select. The biggest question any of us should have at this time of year is why they have not yet introduced a line of NFL Mock Draft toilet paper, so as to turn this nonsense into at least a marginal benefit for society. But that isn't the point here. It is just this: that the Eagles are not a young team anymore and you still cannot say that they are likely to draft a player who will come in and start for them this season. The Eagles are older, especially on defense. There is really no getting around that anymore. They are much older than they were that day in St. Louis. They are measurably older than any of the last three teams that won Super Bowls, as well as the team they themselves took to Jacksonville for Super Bowl XXXIX. The numbers are the numbers. Yet they cannot get as many of their kids on the field as you might expect. They say they like offensive lineman Winston Justice and running back Ryan Moats but they can't get them near the field. They had a world of hope for first-round defensive tackle Brodrick Bunkley last season, at a position of real need, yet they could barely play him at all. Other teams do seem to get their best kids on the field quicker. But, as general manager Tom Heckert says, "sometimes it's because [those teams] have no choice." That is, they aren't very good and are forced to do the on-the-job training thing. The Eagles are rarely in that position these days, and that is clearly to their benefit. Still, the numbers are what they are. Six years ago, the Eagles were built for the future and everyone griped about how a player's 30th birthday had become a death sentence. Today, you wonder where the kids are. So, yes, it is different. Yes, this team is built for now in a way that the Eagles did not used to be. Take experience. Look at the starters - three wideouts; sorry, fullbacks - and compare them from 2001 (first NFC Championship Game) to 2004 (Super Bowl XXXIX) to today. Guess that the linebacker starters this season will be Omar Gaither, Jeremiah Trotter and Takeo Spikes, and that Bunkley will start at defensive tackle. Do the math. 2001 . . . 104 years of experience. 2004 . . . 117 years of experience. 2007 . . . 134 years of experience. 2006, Indianapolis . . . 112 years of experience. 2005, Pittsburgh . . . 121 years of experience. 2004, New England . . . 115 years of experience. So, there. This does not mean that the Eagles are nursing-home old. It isn't anything like that. But they do have more players with double-digit years of experience than at any time in recent memory: William Thomas (10 years), Jon Runyan (12), Trotter (10), Spikes (10) and Brian Dawkins (12), with Donovan McNabb and Jevon Kearse right behind. They have more than twice as many older guys as those recent Super Bowl-winning teams. Heckert and Reid and the rest of the Eagles talk about how the draft is the only way to sustain excellence in a salary-capped world. Fair enough. But how do you get them on the field? If their recent draftees can, in fact, play, that is the question they all need to ask themselves down there. As the stakes have grown with each non-championship season, the team has gotten older. Combine that with a scheme, on both sides of the ball, which apparently is impossible for a rookie to fathom, and this is what you get. Which is what? Put it this way: Unlike that day in St. Louis, you cannot see forever anymore. For the Eagles, it is hard to think of a time when now meant more.